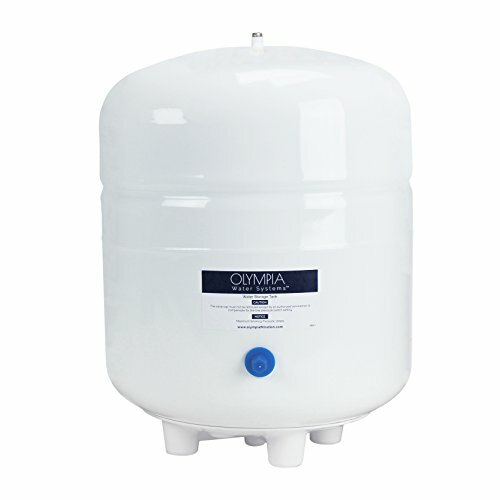 Olympia Water Systems 3.2 gallon pre-pressurized reverse osmosis storage tank is built with stainless steel and includes a tank stand. Stainless steel ¼" NPTM valve for connecting a reverse osmosis system tank ball valve (not included). Applying 3-5 wraps of Teflon tape (not included) on threaded output stem before valve installation is recommended. Tank measures 12" W x 12" D x 18" H to fit inside most under-sink cabinets. Replacement tank for OROS-50 and OROS-80 systems. *For details about our NSF listing, please contact us at support@olympiafiltration.com. If you have any questions about this product by Olympia Water Systems, contact us by completing and submitting the form below. If you are looking for a specif part number, please include it with your message.